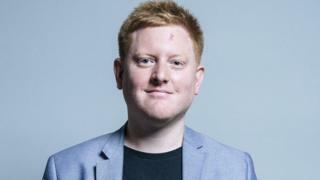 MP Jared O'Mara is not presently attending Parliament on the advice of his GP, a spokesman has said. He was suspended by the Labour Party in October while it investigates misogynistic and homophobic comments he is alleged to have made. He has apologised for online remarks from 2002 and 2004 but denies some more recent claims. The spokesman said he continues to represent his constituents in Sheffield Hallam "in other ways". The 35-year-old MP resigned from the women and equalities committee after political website Guido Fawkes unearthed offensive comments he had made online in 2004. Then Sophie Evans, who had who had met Mr O'Mara on a dating app before he was elected, told the BBC's Daily Politics he had made comments to her that "aren't broadcastable". Mr O'Mara apologised for remarks in 2002 and 2004 but "categorically denies" Ms Evans' allegation. The MP hasn't spoken publically in parliament or his constituency since this apology on 23 October. A statement issued to BBC Radio Sheffield's political reporter Kevin Larkin said: "On the advice of his GP, Jared has limited some of his activities and duties as the MP for Sheffield Hallam. This includes attending Parliament at the present time. "However, Jared continues to serve as the MP for Sheffield Hallam and continues to represent his constituents in other ways. "He and his staff are working very hard to serve his constituents in Sheffield Hallam, including with casework enquiries."